Most homeowners associate termite treatment with tenting and fumigation. These services can be extraordinarily inconvenient for homeowners in Escondido, California, as it requires that they leave their homes for days at a time and bag their foods and medications. However, fumigation isn’t the only treatment option that’s available. At Kilter Termite and Pest Control, our KILGUARD system is targeted directly at infestation sites, so there’s no need for noxious fumes and odors. You can stay in your home throughout the process without having to worry about lingering chemical residue throughout your house. At Kilter, we not only utilize the most advanced termite treatment product, but we also provide exceptional service. For example, we offer homeowners in Escondido, CA, a free termite inspection, so they can get an honest assessment of their homes without incurring any cost or obligation. 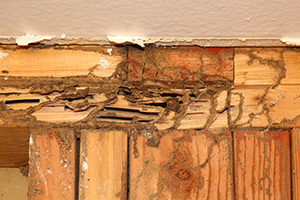 Additionally, after we have eliminated an infestation, we can help our customers restore areas of their homes that have been damaged by termites with wood replacement services from our team of experienced craftsmen. To learn more about the benefits of turning to Kilter Termite and Pest Control for termite treatment, contact us today. We are proud to serve homeowners in Escondido, CA, and all surrounding areas.